Angelstar Creations Metaphysical Web Pages - My Experiences with Transcendental Meditation and the organization/movement - TM - T.M. Books and Links to Websites that changed my perception of TM, and other links. This May Be very much critical of TM®, so don’t read it if you are a proponent. If you are thinking of starting the practice or in doubt about TM then you should very likely read this article, which is my own story from start to finish regarding Transcendental Meditation®. You can certainly come to your own conclusions. All that is written here is the truth, as I see it. I believe if someone has a psychiatric problem they should seek the advice of a professional before they start any spiritual practice. That's my opinion. See what's written near the bottom of this page. I believe something similar should be written on all TM® literature. As of this moment in time I realize I didn’t really know what I was doing at the age of 24 and I didn’t really know what was best for me. I didn’t have a clue. 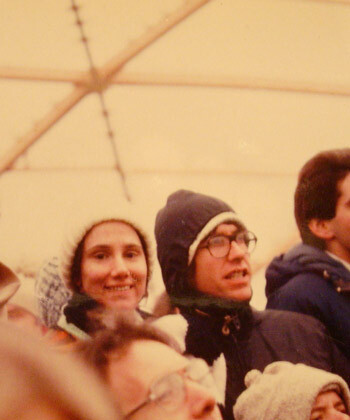 I started practicing Transcendental Meditation® (TM®) at this young age of 24. This was many years ago. I was told it is an easy, effortless technique to gain enlightenment. At first I was told: through TM® one would gain enlightenment in about 8 years. Yeah, right. I now believe that I am very gullible and suggestible. Read on….. if you dare…. I first heard about TM® by reading the book about the Beatles, called “The Beatles” by Hunter Davies. I also read some articles in magazines about the Beatles and TM®. I remember that they talked about learning TM® and how it was beneficial in many areas of life. I was a real fan of the Beatles! I was also drawn to learn TM® because it came out of India and I was always drawn to things and ideas from India. I wanted to improve myself. I was extremely shy. When I was in high school I was so scared of speaking in front of even my small group of classmates that I would throw up on my way to the school bus on the day that I had speech class - I didn't force myself to do that, I just did because I was so nervous. I hardly talked, and people in my extended family called me the shy one; the quiet one. Also, even in High School I was searching for “something more” because I knew that there was more to life than what I saw on this, the physical plane of existence. I read several books including a book called “Yoga, Youth and Reincarnation” and I read several Edgar Cayce books. I wanted to learn more about reincarnation because I knew in my heart that reincarnation is reality. I became somewhat interested in learning more about Witchcraft as well, but never got very far with it. I did become interested in eating more healthy foods. I was sitting at my parents’ home, in Methuen, Massachusetts, one evening in 1974 reading the newspaper, and discovered that same evening there was a lecture at the library in Lawrence about TM®. I wanted to find out more about it. Initially I attended the two required Introductory meetings (required to learn TM®). The two TM® teachers who led the meetings were very sweet and adorable. I was totally sold out and hooked. Then I went through the interview process and was eventually initiated; I was taught the TM® technique. There is a very religious-looking procedure performed by the TM® teacher when one is initiated. It is called The Puja and includes chanting in front of an alter and placing of fruit, flowers and a white handkerchief brought by the new initiate on to the alter. They didn't tell me much about this beforehand except to have the items with me. I only discovered what they were for after I had paid my money and was in the room ready to be initiated. The TM® people say it is not a religion but I have experienced a lot of very religious-looking sessions. Check out my video on YouTube if you'd Like: http://www.youtube.com/watch?v=0smU-7FHzyE. Ignore the fact that YouTube says this video is an "Age Restricted Video." The TM people don't like my video and one of them put a flag on it as inappropriate. It's a fine video. There is at least one Web site on the Internet by an ex-TM® teacher now that says that those who attend the Introductory Lectures are being hypnotized. http://www.suggestibility.org/. I've also read that the Puja routine is actually hypnosis. Some people also say that TM® is a hypnosis technique; that we are hypnotized when we practice TM®. Is this true? I don’t know yet for sure, but I feel that it's true. There are also Web sites that say that TM® is a cult group. I do also think this is true, that many of the people who have joined the TM® Organization and become obsessed with “doing their program” regularly and with doing what Maharishi Mahesh Yogi - Founder of the TM Organization - says to do are part of a cult group. But I don’t think the people who only meditate 20 minutes twice a day (or less) are part of a cult group. After being initiated I attended the four nights of checking as I had agreed to do at the TM® center in North Andover, Massachusetts. The above mentioned web site also says there is hypnotism going on during these “checking” meetings. I know for a fact that anyone who is now involved in TM® and is an exponent of TM® would vehemently disagree with this idea. They would point out all the research done that says that TM® is good for anyone. The web site and some of the books I have read say that the research is false and created by the TM® Organization and that any bad psychological results of TM® are hidden and never spoken about. Anyway, I was drawn in and wanted to attend more meetings even after the four nights of checking. I started attending the weekly meetings at the TM® center. I heard about the “Residence Courses” where the attendees hear lectures by TM® teachers and watch videos of Maharishi talking about TM®, and where participants "round" for a weekend or a bit longer. "Rounding" is doing extra sessions of TM® along with Yoga asanas - exercises/postures that were taught during these residence courses. I’ve read that during these residence courses we were more and more hypnotized. We were told to not make any decisions during these courses. My first Residence Course was in New Hampshire. I also attended at least one in Massachusetts and one in Connecticut. I don’t know if my shyness improved or not, because I pretty much stayed to myself. Even though I was so shy, I still met many interesting people during these courses. Eventually the TM® teachers at my TM® center in Andover mentioned to me about the opportunity that I might want go be on staff at the TM® Academy for the Science of Creative Intelligence “retreat” center in upstate New York. I applied and was accepted; and I quit my job of a couple of years at that time. I wanted to become a TM® teacher. I thought TM® would eventually decrease my shyness, and my self-esteem would increase over time and that I would be able to become a TM® teacher; I wanted to help other people find peace, contentment and enlightenment. 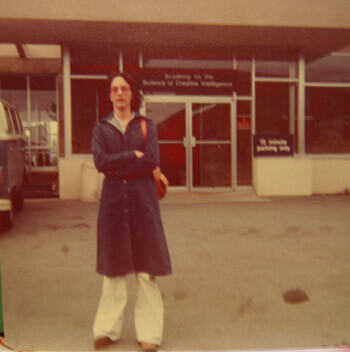 I found out somehow or other that when one was accepted to be on staff, it was preferred that we did not travel outside of the academy, so I had my mother drive me to the academy and had her leave me there with no car (see picture to the left of me shortly after I arrived) in 1976. Was I so hypnotized that I wanted to do whatever the TM® people told me to do without question?! I worked at this place for about 10 months in 1976 and 1977. During that time the staff members got room and board, all meals, and were paid a stipend of $25.00 per month. I lived, meditated and slept in a room, with three beds, with two or three other women and we shared a bathroom down the hall with others in our building (see picture of me to the right in my shared room). We ate in a community dining room and sometimes meditated in other big rooms as a group. We also watched videos of Maharishi a lot. We were earning “credit” toward courses that we could attend, such as Teacher Training courses. After being there for some time I got my own room, still with a bathroom down the hall; I don’t think I had that room for very long. I also met the man, Bert, who was to be my husband, and the father of my child, at this time. He was from California; I always wanted to live in California and we seemed to "click." I’m not so sure that TM® was helping me in my self-esteem but I know that going out and being with people and joining a group did help with my self-esteem. I tried to get a position in the office of this place but found out that only "Governors of the Age of Enlightenment" were allowed to take those positions. "Governors" were TM teachers who knew very advanced TM techniques and were considered special. I had worked in offices for many years, but still couldn't get an office position. So, because of this, I stayed working as a maid. Some time at the age of 26, about August of 1977, something happened and the academy asked a bunch of people to leave. I believe they were running out of money or something. Anyway, I was one of the people asked to leave. They gave us a couple of weeks notice. I did not want to leave, but after being asked to leave, and knowing that I would not be able to plead my case, I became angry that they would do such a thing. I called my father and mother and they came and picked me up right away and brought me home. My parents even gave a couple of my friends who had also been asked to leave rides home; one person lived in Connecticut and the other one lived in Boston. After some short period of time my “credit” was frozen and eventually I lost it all. I think it was over $2,000 in all that I lost. $2,000 was a lot of money in those days - the later part of the 1970's. Well, at the time I figured it was my Karma. I went back home and got a pretty good job. Eventually I moved in to the TM® center in Andover, Massachusetts and continued to work in my job, also in Andover, Massachusetts. The man I met at the academy, Bert, called me from California and asked me to marry him. I said, “Come on out here and we’ll talk.” So he did! He moved out from California to Massachusetts. We got along very well. He also moved in to another room at the same TM® center before we were married (it was a large place) and we shared a room after we got married. We got married toward the end of 1977. Right around that time the Boston Globe printed the TM mantras in their newspaper and a friend of ours showed it to us and I remember being shocked and appalled. We lived together there at the TM® center till May of 1978. We then both quit our jobs and left Massachusetts. My husband had outfitted our red van so that we could live in it and enjoy an extended trip across the country. We moved to California in 1978. On the way to California we stopped off at the same Academy of the Science of Creative Intelligence (mentioned above), in upstate New York where we met. I was not allowed out of the van because the place became only for men at the end of 1977 (right after I left). I wasn’t happy being closed up in a small van while my husband went and talked to some of his friends. We were there for several hours. To tell you the truth, I was very nervous about moving to California even though I had wanted to do so. We also stopped off at the Maharishi International University (now Maharishi University of Management) in Fairfield, Iowa on our trip and felt very fortunate indeed to be there. In California we worked for a bit. We did several short stints on staff, with the TM® group, at Stanford University and near Lake Tahoe. We were there to earn credit to attend some courses so we could learn the TM-Sidhi’s course. The TM-Sidhis were supposed to accelerate one’s growth and evolution toward enlightenment even more quickly than TM alone. In 1979 we heard about a TM® group in Missouri, so we moved there and worked on staff there for a year and a half. The Maharishi had been asking people to go be in groups and that it would help the world consciousness rise, and help create world peace. So we went. We wanted to help create world peace. We got the usual stipend of $25.00 per month, room and board, food, and we also earned credit toward learning the TM-Sidhis course. We both learned these TM-Sidhis during 1979 and learned the flying/levitation “sutra” at the end of 1979 in Fairfield, Iowa. This time we did use our “credit.” While we were there in Fairfield for two weeks the “Golden Domes” were being built. 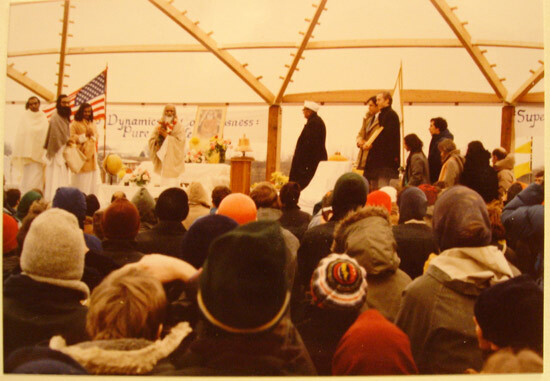 Also the Maharishi was there and spoke to the group in the new skeleton of the men’s Golden Dome (see picture above with all the heads - It was freezing and we had waited a long time, but we didn't mind). I felt a wave of appreciation and love and I felt very honored to be there in person with Maharishi (even though there were over a thousand of us there). Was this just hypnotism? To the right see the picture of me and my husband looking adoringly at Maharishi. After learning the levitation sutra we went back to Missouri to work some more. 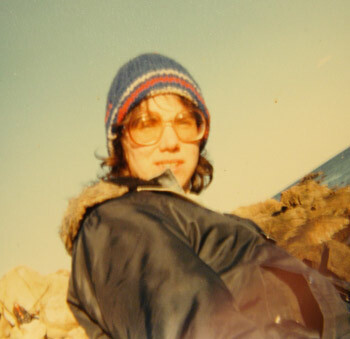 We eventually left Missouri and moved back to California - that was at the beginning of 1980. I found a web site where they referred to Maharishi as "Marshy." I thought that was interesting. I’ve had probably about five meditations in my life where I went into a deep darkness and when I came out I didn’t remember time passing. Is this a good thing? or a bad thing, like the above mentioned web site seems to imply. Was this just being hypnotized? The TM teachers said it was a good thing. My shamanism teacher thinks it's a bad thing. We worked some in the “regular” world in California, but by this time we were really attached to being part of the TM® world. We eventually joined a Sidha Village in Los Altos, California and worked for them. We were there for about two years. We were earning a small stipend, room and board and meals and nothing else. I actually got a “real job” in an office during much of this time. 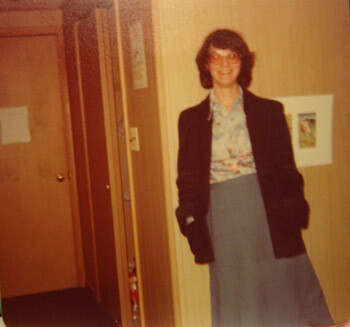 Sometime toward the end of 1980 I wanted to have a child; my clock was ticking. So I, with the help of a friend, convinced my husband and became pregnant. A friend of ours also convinced him that this would be a good thing, which it is! I attended a few birthing classes while we lived there. We were still at the Sidha Village in August of 1981 when I had my child. When our daughter was just a month old the Sidha Village was winding down so we moved out. We lived in our van (fixed to live in) for some time, traveled a bit around California with our baby. We worked at the TM® center in Palo Alto and eventually got a small apartment in East Palo Alto. My daughter attended childcare for free for a while. My husband worked at the Maharishi International University (now called The Maharishi University of Management) for about 15 years. We bought a small house in Fairfield in 1982 and owned it till 1997. We both attended group meditation practice in the domes twice a day. Well, actually sometimes I couldn’t stand to be there in the dome, and unbeknownst to my husband, I would sometimes sneak out of the ladies dome and go home, then come back shortly before the women were “let out” of the dome. I would go in to the entry way of the dome and stay there and then exit to meet my husband as he got out of the men’s dome. I felt much better when I did this and I felt much worse when I forced myself to attend the group meditation and TM-Sidhis practice. Sometimes also I would bring a book or magazine and read in the ladies’ rest room so I wouldn’t have to do the group practice, which was starting to make me feel more and more uncomfortable in my mind. If I mentioned this to any of the regular practitioners or the TM® teachers they would say I was doing something wrong. I don’t think so! Sometimes I just HAD to get out of that place! My daughter attended The Maharishi School of the Age of Enlightenment, which we had been told was the best school in the world. She attended from Kindergarten through most of fourth grade. She has dyslexia and eventually they said they couldn’t help her. They asked us to take her out of their school. Well, her fourth grade teacher was psychotic (she would at times chastise a student in front of the entire class, among other nasty things), so I took her out of there a few weeks before fourth grade ended and put her in to the public school system, which at the time had only a couple of weeks left. She had no clue what was going on but she agreed to change schools because of the fact that the public schools had less weeks left of fourth grade, plus we went and met her would-be teacher and some of her would-be fellow students. She liked them. Like I said, I had visited the public school of that town, Fairfield, Iowa. The expensive private school couldn't help her! They didn't want to spend the money! Also, I wanted them to fire this psycho teacher. I had even spoken with the principal of the school. They wouldn't fire her. One day I walked into the psycho teacher's classroom and told my daughter that if she switched to the public school she'd only have a couple of weeks left till summer (the private school had many weeks left) and her days would be shorter. I was angry. I was unhappy. So, like I said, I walked into her classroom, whispered in her ear that I was removing her and she was going to attend the public school. I didn't wait till the end of the year. I wanted her out of that classroom. I opened her desk and threw all her school stuff into a large black plastic bag that I had brought. It was the middle of class! Erica was totally happy to leave that school. She had great teachers for kindergarten through 3rd grade, but 4th grade was a horror. From then on she attended public school and they helped her much more than that private school ever did. So if anyone tells you that the Maharishi School of the Age of Enlightenment (or whatever it’s called now) is the best school in the world, don’t believe them. They only have such high scores because they kick out the students who can’t cut the grade. That's a fact that I experienced first-hand. My daughter learned the TM® "walking technique" when she was about five years old. I believe my daughter had problems with TM® from the beginning. She once told me that someone, as part of an experiment in high school, tried to hypnotize her and she was not able to be hypnotized. Hmmmm….. She forgot her mantra at first and got another one at the age of nine. Then sometime when she was a teenager she said that meditating gave her a headache. I had her TM® checked, or I tried to convince her to have her TM® practice checked. I think she did it a couple of times. "Checking" is where a meditator sits in a quiet room with a TM teacher and is taken through a specific process to make sure the meditator is doing the TM practice correctly. My daughter said it gave her a headache every time. Double hmmmm….. She no longer practices TM. That’s something to think about. I've also read that the TM checking procedure is a hypnosis procedure. In 1994 we met Rob Robb and got more and more away from TM®. Even my husband who was a TM fanatic became less and less obsessed with doing his “regular” TM® practice. But then, that is another story. I have continued practicing TM® off and on since 1994. I quit going to the Golden Dome in 1996. Me and my husband and my daughter left Fairfield in 1997 and moved to Taos, New Mexico. I left my husband in 1999 and got divorced in 2000. I lived in Fairfield from June of 1999 till the end of 2001with my daughter, without ever practicing TM either at home or in the ladies' dome, and moved back here to Taos on December 27, 2001. My daughter left Fairfield on January 1, 2003. She moved to L.A. and loves it there. Added in 2008: Bert and I moved back in together the beginning of 2006. We remarried in June of this year. We worked out our stuff. Neither of us are practicing TM® any more. I stumbled on to the below mentioned web site a year or more ago and heard about the book TM and Cult Mania but I guess I wasn’t ready to read it until now. I finally read it in August of 2005. I, at this moment in time, am no longer practicing TM. I don’t know if I will ever practice it again. I’ll keep you posted as to whether I feel any different over time. As of this writing, it’s only been a few days since I quit totally. Like I said, I wasn't really ready till now to read anything that was against TM, but now I did and now I know. All I ask is that people THINK and read a lot, not just the TM® group propaganda. Please check other Web sites and books before deciding. September 3, 2015 .... 40 - count 'em - 40 years ago today I started the practice of Transcendental Meditation. Just thought I'd mention it. I still remember the name of the man who taught me - John Steiber. And the other man at the TM center in North Andover, MA - Mitch Mazur. Have any questions for me regarding this? Just contact me. August 4, 2015 .... I'm again reading "Maharishi at '433': The Story of Maharishi Mahesh Yogi's First Visit to the United States" (2nd edition Los Angeles 1979) by Helena Olson. The setting is at a house at 433 Harvard Boulevard, in or near Los Angeles, CA. I guess I read it the first time in the 1970s. The original book was "A Hermit in the House" (1967) by the same author. This 1979 version includes many charts, other information and a transcript from a 1959 Maharishi lecture. The actual story, which ends on page 166, is an interesting book about the beginnings of the Transcendental Meditation Movement. I want to mention a couple of items that caught my attention. First, the author talks about the theater where she works and how these actors put on a performance and that Maharishi was definitely putting on a performance. I wonder if he was hypnotizing everyone who came to his lectures and reading their minds. He seemed to go along taking and taking and taking and the people around him gave and gave and gave. Second, I always heard that TM could help anyone, but she says of someone who was a smoker and finding fault with everything, "he or she was not really going to find the answer in the TM program ... because the deep desire for real knowledge was not there." So I guess it's not for everyone. Click or tap here to see another person's view on a portion of this book - "Maharishi Mahesh demeans children. "Yes, he did. Well, the parents did too. They let him walk into the author's teenage daughter's private room on his first day there. He wanted to stay in that room and they let him! Then some people came from India and their younger daughter was moved from her room into a closet so the Indian lady could have a room! January 31, 2014 .... I read the following in the book "The Spiritual Tourist" by Mick Brown (particularly page 195 in the hard-cover version) and I thought I'd share it here. ".... the Maharishi Mahesh, who had appeared at the side of the Beatles, draped in white, garlanded in flowers, smiling beatifically, and promising that it was not necessary to pursue a life of renunciation in order to attain enlightenment; through 'transcendental meditation' practitioners could enjoy 'the positive experience of Heavenly Bliss' in their lifetime. The news that you could have your cake and eat it proved immediately attractive. Notwithstanding the fall-out with John Lennon over charges of sexual impropriety (never proved) and the disillusionment of Paul McCartney - 'We thought there was more to him than there was,' McCartney said. 'He's human, we thought at first he wasn't' - The Maharishi went on to build a world-wide organisation, shrewdly dispensing with the Eastern trappings and the references to 'Heavenly Bliss' in favour of flow-charts and statistics demonstrating TM's benefits to health and business efficiency." January 14, 2014 .... I am no longer taking any psychotic drugs or going to a therapist or psychiatrist and don't practice TM any more and haven't for ages. I'm happy living with my husband in our little home out on "the mesa" in northern New Mexico. Our daughter still lives in L.A. and doesn't practice TM either. I do still have a prescription for clonazepam though from my regular doctor for when breathing and praying and natural remedies don't seem to be working. April 26, 2013 .... I didn’t know about anything else at all when I joined the TM movement at the young age of 24. I didn’t do any proper research. I believed what they told me that it was the best, and I never delved into anything else during my TM “membership.” Since I basically quit their movement and technique I have read many books and such. I enjoyed the book by ParahansaYogananda very much. I have tried several psychics, including Rob Robb and bj King and joined a Celtic Shamanism group, among other things. I had better experiences with the Shamanism group than I ever had with TM. We have a book around here someplace by Vasant Lad and practiced ayurveda within the TM organization. We also had our astrological readings done within the TM organization. We threw a lot of money to the TM people. Right now I am basically doing nothing. I have found that everything I have tried has some sort of aspect that I don’t like. For example, my shamanism teacher smoked cigarettes and although he was great at setting up shamanism journeys and such he was lousy at being grateful for what he had and complained a lot, among other things. That’s all I’ll say since I don’t really want to gossip about living people. Where am I right now? I’m reading the Harry Potter books, living off the grid with my husband out in the middle of nowhere in Northern New Mexico and enjoying my life. I’m almost 62 years old and probably won’t try any new gurus. I am enjoying the presence of my family, friends, angels and guides in my life and around me and assume that I will get what I need in my life. Sometimes when I can’t get to sleep at night I do breathing exercises, sometimes even do a bit of TM, or say the Hail Mary to myself for a while. I find that if I get a good night’s sleep I feel good and am happy during the day. I’m still going to my therapist but am not taking any psychiatric drugs right now except one other thing I try when I can’t sleep which is clonazepam. Life is good. July 4, 2012 .... I still have the Gabapentin and take it very occasionally if my mind is working overtime and I can't get to sleep at night. It helps. Otherwise all is well. Still not practicing TM very often at all. April 21, 2012 .... Well, I'm off my meds and have been for several months. I feel fine. I do continue to go to therapy at least once a month. I am on a anti-inflamitory medication subscribed by my medical doctor for my arthritis pain, I don't know if that's effecting my mind or not. Maybe not. Anyway, I am sleeping most nights which is important to me. I am not practicing TM except very occasionally like when I can't sleep at night. Sometimes it helps sometimes it does not. December 5, 2011 .... I started Transcendental Meditation (TM) when I was 24 years old because I was fearful of everything. That's virtually all I felt was fear. I was quite shut down to other feelings. After I started TM I felt other feelings and they were not always pleasant. Also when I started TM, or at some time, I noticed I felt often prickly all over my skin and felt uncomfortable in my body, I also felt irritated and anxious. At times I would not practice TM and would feel better. The TM people said it was "release of stress" and was a good thing. "Release of stress" was their catch-all term whenever someone felt uncomfortable. I just wanted to feel comfortable in my body. I wanted to not be so fearful of everything. I also wanted to sleep! Nancy T., mentioned elsewhere on my metaphysical site, probably said I was under psychic attack when I felt prickly or didn't sleep at night. The new age metaphysical people probably said to meditate more or to get a massage or to get acupuncture, among other things. I don't think I was ever under psychic attack. Well, the massages and other things did help - sometimes and only for some time. Then I had to go back again and again. All that stuff is expensive and It didn't always work! So now for about two weeks I've been on a new medication - Gabapentin, also called Neurontin - it seems to be working. December 4, 2011 - I am back on medication again. I was diagnosed as bipolar. I will continue to take drugs until I decide to stop again. Just remember what I said below (or above) that Transcendental Meditation isn't the greatest thing in the world as they claim. See your health care professional before you start and have a bad reaction like I did. No more TM for me, ever. July 14, 2011 - If you currently practice the TM technique and it makes you uncomfortable, quit and see a professional psychiatrist and/or doctor. That's my advice anyway. July 6, 2011 - I still don't meditate. I have a sister who does still practice TM, 10 minutes twice a day. She feels fine and finds no problem with the technique. So don't listen to me if you don't want to. Do what you feel comfortable with. Just don't be like a sheep and follow along without doing your own research first that's all I'm saying. Do what's right for you. If you have a psychiatric problem see a professional. See what I have written near the bottom of this page. June 10, 2011 - I did start for a little while but it just makes me feel spaced-out and like I'm hypnotized. So much for that idea. It just makes me feel weird. May 18, 2010 - I have decided to start doing TM and the Sidhis program again. I'm going to start slowly. I think I had been doing it incorrectly in the past; I think I was forcing it. I've been doing it again for about 4 days after not practicing the technique, except very occasionally, for over 10 years. January 26, 2010 - People keep giving my video on YouTube a "1" (or a thumbs down) and they keep flagging my video (see link above). I think it's some immature TM people. It is really so not fair for them to be doing such things. Do you really want to be a part of a group like this? January 19, 2010 - I still haven't done TM for quite a while. About my video on YouTube: Someone keeps flagging the video and I don't know why. It is a fine video and it is just my own opinion. I think it is being flagged and given "1s" by the TM people. Do you really want to be involved with a group that would do such immature things? Think about it and read more books that are NOT put out by the TM group! Look at my list of Websites and Books at the links above. Read, read, read. That's my advice anyway. October 26, 2008 - I virtually haven't done TM for over Three years and I feel fine. I have done other types of meditation and I have done shamanic journeying and have found as much and maybe more good results from these than I did from TM. July 2008. Bert and I got re-married again last month!! This is mentioned above as well. We no longer practice TM and that is just fine! September 27, 2007. I've been finding a lot of discussion about other New Age techniques on the Internet - both positive and negative. Is the New Age and are Metaphysical techniques real? Or is it all just a farce? Do we reincarnate? Is there more than this "physical," "middle world" reality? Somebody tell me! I've been "searching" for the truth for far too many years. I always thought that there must be more than only this physical reality. I hope so, but it looks to me that I may not find out for sure till I die. I just wish I could see something, like an angel, a fairy, someone disappear, someone walk through a wall, someone manifest something (like gold) in their hand, or SOMETHING. January 15, 2007. I have been doing other techniques and I occasionally "practice" TM. I find that just living life to the fullest is the best way to go. I still read many books and watch movies about metaphysical stuff. The last movie we watched was "The Secret," and I own the book - It's GREAT! I also attend college part-time. Life is good and I just keep on keeping on. I originally wrote this in 2006. Updated April 26, 2013, Last updated January 14, 2014. I read this over and change a bit, mainly clarifications, from time to time. The fine print (Disclaimer): I give absolutely no guarantee that any of these affirmations, clearings, prayers or any of this works. It is all up to you! PLEASE NOTE (Another Disclaimer): These clearings, affirmations and meditations on this site can be powerful, energizing, and life-changing tools for growth... but they are not intended to be a substitute for medical care. If you are ill, sick or dealing with any sort of mental or emotional disorder, are undergoing psychotherapy, are experiencing seizures, or have any other physical, neurological or neurorespiratory or neuro-any-thing-else disease, we suggest that you seek professional advice and consult your physician or therapist immediately. This is my personal Web site. I make absolutely no profit from this site.